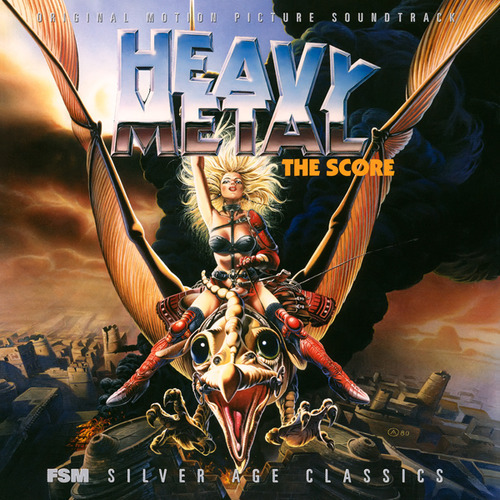 Listening to FSM's Heavy Metal for the first time and have fond memories of the score. Love the theme at 1:17 in Discovery and favorite cue has to be "The Flight to Temple". Also like the similar eerie sound he used in Ghostbusters. Stunning score! Great score! Thanks to FSM! This is the score that changed my buying habits. I'd never heard it, but heard so much about it & it was Bernstein, so I bought it...& I didn't like it! No criticism of the score, you can't like everything, but I'd spent the best part of £20 & sent all the way to America for it. So now I just buy the scores that I know I like. As for the Heavy Metal score, it was a blind buy for me. I admit I didn't like it as much as I thought I would but there are a handful of tracks I enjoy ("Getting Bombed," the jazzy "Harry" and "The Next Morning," etc.). It's been a while so perhaps another listening is in order. Some scores take time to grow on me. I'm super busy with work this time of year but feel free to pm me at AAX. If it is something I have laying around, I can certainly do it. I have a huge box of cds I want to scan. So many I sometimes can't decide what to do next. BTW, be on the look out for COOL WORLD, CHITTY CHITTY BANG BANG, and some nearly NSFW Italian erotica/comedy covers ;) coming soon. How do I PM you on AAX? Are you the same Scott who moderates the board over there? I am not Scott. I am Scott H.
Scott, the site owner, is a very nice and helpful fellow. To pm, log in. Go to Forums. Click on new messages. Somewhere on the lower left hand side you will see a compose message option. This is a score I really like from the old LP programme, but I don't like the C&C presentation as much. It's a lovely job from FSM, a thing of beauty, but I've only played the CD about twice and it's overlong for me. I maybe need to re-edit it back to the LP programme or trim off some of the fat.